Juan had been singing to himself when he suddenly saw a large machine land near one of the artesian wells on the “Los Lunarejos” farm. An unspecified number of people – a large number of them – descended from it, possibly more than 50 individuals, by Juan’s reckoning. Their height and appearance was normal, with nothing special to distinguish them. The wore blue uniforms without helmets or hats, walking single file in formation and did not speak or exchange gestures among themselves. Perhaps on account of this uniform, and his own military service, the witness has always referred to them as the “soldiers”, dubbing them “the troops”. The “soldiers” headed for the artesian well, and Palmareña lost sight of them shortly after, suggesting they descended to a pool of water known as La Alberca, whose bottom could not be seen from Juan’s guard shack. Five or six “bosses” (literally) remained outside on an edge, looking toward Juan. The “bosses” took out something resembling a flashlight, whose light they shone at the watchman’s eyes. Juan hid behind the shack to avoid the bothersome beam, but whenever he looked out, the “bosses” pointed the “flashlight” at him. The Following Days: During the following days, Juan el de La Palmareña walked around the landing area, coming back to say: “Anyone can go there and see the traces they left behind.” Incredible though it may seem, neither Los Chícharos nor anyone else bothered to walk the scant meters that separated the melon field from the artesian well to see the marks on the ground that their co-woker was referring to. They did not take him seriously, and quite the contrary, began joking and contradicting everything he said. They had to change their attitude, given Palmareña’s irritability, as he even pulled a knife on them after they contradicted him, laughing and saying he hadn’t seen anything at all. The man was frightened and would not let go of his shotgun, to the extent that Los Chícharos, fearing that “he might blow someone away”, chose to relieve him of his shotgun shells. Juan retold his story informally and unofficially to the Guardia Civil on duty in the neighboring barracks. Once more, the security forces shrugged, thinking he was deranged, and refused to file an official report. Investigating the Case: A few days later, during the olive harvest in September 1971, we would see Los Chícharos on a daily basis, but they never told us anything, nor did the word spread among the squad of workers – proof that no importance had been given to Palmareña’s “yarn”. The first news of what happened reached us two years later, in the spring of 1974, during a wake held in Aznalcollar. The first interview with the sole witness was carried out by Manuel Osuna and Felipe Laffite, and the latter still has the audiotape in his possession. 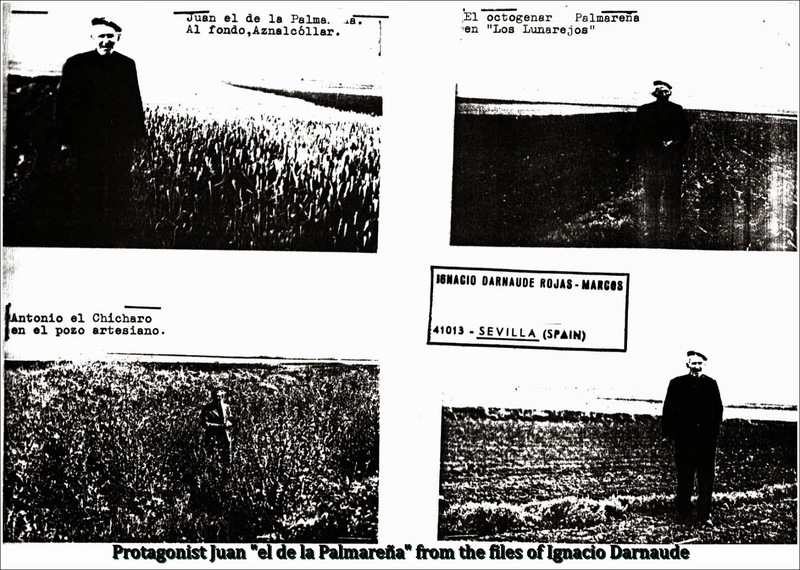 On April 19, 1974, Manuel Osuna and this author visited the scene of the events with Juan el de La Palmareña and his grandson. A few days later, we toured “Los Lunarejos” with Antonio el Chícharo, taking down his statement. Subsequently, Pedro del Prado, Justice of the Peace of Aznalcollar, questioned Felipe el Chícharo, whose statements fully coincided with those of his brother Antonio, in Seville on July 23, 1974. The case went on to become a perennial entry in books on UFOs, which stressed the fact that “fifty humanoids” had been seen emerging from a craft as long as a bus, or perhaps larger. Juan José Benítez, the journalist turned ufologist whose books dominated the Spanish market of the ‘70s and ‘80s, managed to interview Juan el de La Palmereña (Benítez refers to him as Juan el Palmareño) years later for a newspaper article that later appear in La Gaceta del Norte in July 20, 1975. During this subsequent interview, the aged peasant noted that he described the figures descending from the object he identified as a bus as “little men” due to their short stature. He contradicted Darnaude’s report above, saying that he never described them as “soldiers” – having seen many in his lifetime – and that they didn’t wear any caps, weapons or backpacks that would identify them as such. When asked by Benítez why he didn’t avail himself of the shotgun to open fire against the intruders, the witness replied: “Do you take me for a fool? If I’d fired at them, they would’ve surrounded me, and I wouldn’t be here to tell the tale.” He stressed that the object’s shape had been elongated like that of a bus and with lights, and could not have been a helicopter as some had suggested. It is likely that Aznalcollar would have never been remembered had it not been for one of the most devastating ecological disasters in Europe. In April 1998, a containment wall at the Boliden-Apirsa company gave way, unleashing a tidal wave of hazardous waste that washed throughout the area, stopping at the Doñana State Park. The oozing mass of mercury, led and iron derived from iron pyrite washing operations also contained chemical and toxical residue from other industrial parks. According to Jose Manuel García Bautista, who wrote a lengthy article about the subject ("Avistamientos OVNI en Aznalcollar Tras la Reapertura de la Explotación Minera de la Empresa Boliden-Apirsa"), a witness driving along the N-433 highway had seen a UFO directly over this containment pond on the night of the disaster, with additional sightings of craft on April 30th.